Shirts With Random Triangles: Nebraska Adds Four-Star WR Prospect Keyshawn Johnson Jr. To Its 2017 Recruiting Class. Nebraska Adds Four-Star WR Prospect Keyshawn Johnson Jr. To Its 2017 Recruiting Class. 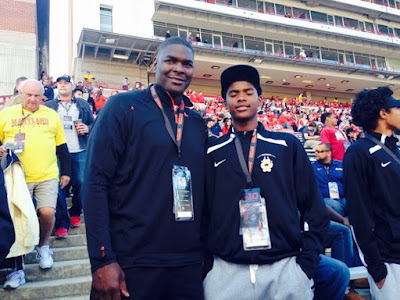 Keyshawn Johnson and Keyshawn Johnson Jr. Image via cleveland.com. Nebraska has added a four-star prospect with a rather notable NFL pedigree to its 2017 recruiting class. Mission Viejo, Ca. high school junior wide receiver Keyshawn Johnson Jr. committed to the Cornhuskers on Wednesday. Johnson, the son of NFL legend Keyshawn Johnson, is the third commitment to Nebraska's 2017 recruiting class. He made the announcement via video on Bleacher Report. 247Sports grades Johnson as a four-star wide receiver prospect. The recruiting website ranks Johnson at no. 27 among WR prospects for 2016, at no. 26 among 2016 prospects from the state of California, and at no. 220 among 2017 prospects nationwide. Johnson attends Calabasas High School in Calabasas, Ca. He stands 6'1, and weighs 195 lbs.